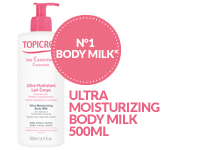 My 1st Ultra-Moisturizing Milk: Specially formulated for delicate and dry skin of babies, its creamy texture provides fast and long-lasting hydration during 24hrs. 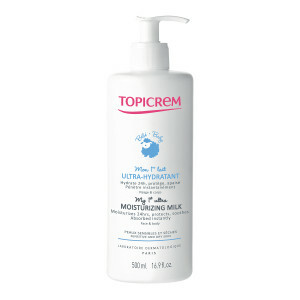 High tolerance, tested under dermatological and pediatric control, hypoallergenic, paraben free. Apply once a day. AQUA (WATER) . PARAFFINUM LIQUIDUM (MINERAL OIL) . GLYCERIN . CETEARYL ETHYLHEXANOATE . UREA . ISOPROPYL ISOSTEARATE . CERA ALBA (BEESWAX) . PALMITIC ACID . STEARIC ACID . GLYCERYL STEARATE . PEG-100 STEARATE . POLYSORBATE 60 . XANTHAN GUM . 1,2-HEXANEDIOL . SORBITAN ISOSTEARATE . SODIUM ACRYLATE/ACRYLOYLDIMETHYLTAURATE/DIMETHYLACRYLAMIDE CROSSPOLYMER . ISOHEXADECANE . GLYCERYL CAPRYLATE . CARBOMER . CHLORPHENESIN . SODIUM HYDROXIDE . PARFUM (FRAGRANCE) .